How to conduct ICO, in which projects to invest in 2018 and what will happen in crypto legislation? 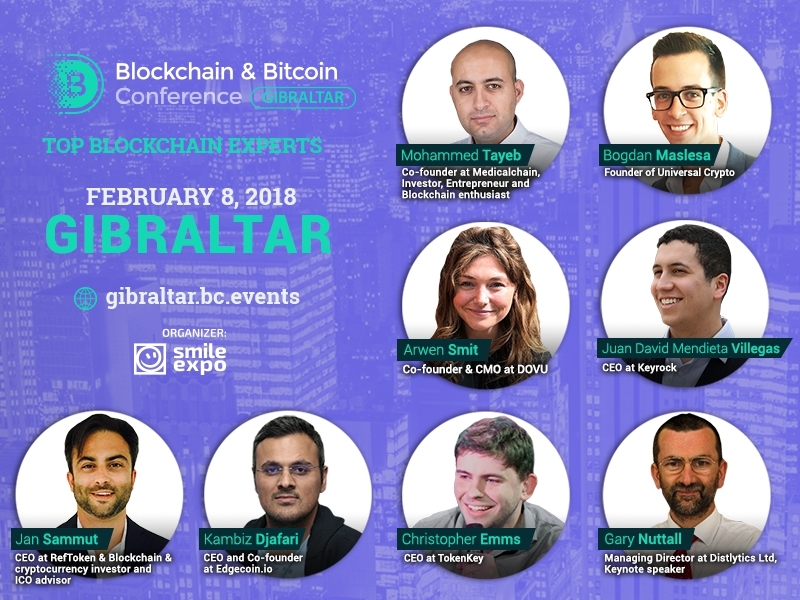 These questions will be answered by the Blockchain & Bitcoin Conference Gibraltar speakers. We have listed the key figures and topics of the upcoming conference. The headliner of the event will be also a blockchain entrepreneur, a specialist in venture and crypto investment, CEO at TokenKey Christopher Emms. He will tell the audience how to attract investors and carry out ICO campaign without common errors. How to make money on cryptocurrencies? This issue will be discussed in the report of the Head of Keyrock Juan David Mendieta Villegas. He will advise which cryptocurrencies are better to invest in and how to manage your assets properly to increase revenue. The co-founder of Medchain Mohammed Tayeb will present a report on ‘Blockchain in the healthcare space’. The expert will explain how to improve medical services using smart contracts and distributed ledger. The founder of Universal Crypto Bogdan Maslesa will tell about the role of blockchain in the society in the future, and explain why IT professionals today should pay more attention to the distributed ledger technology. How to eliminate weaknesses of advertising networks with the help of smart contracts, conduct successful ICO and expand the audience of your project in the shortest time possible – these issues to be covered by the CEO at RefToken Jan Sammut. The CEO and co-founder of Edgecoin.io Kambiz Djafari will explain the impact of tokens on the economy, their classification, and application fields.